For the following observations we are principally indebted to Sturm. "Instead of regarding the sea as an object of terror, let us consider the wonders and the benefits which it presents to us. It must be granted that when the waves swell into mountains, and the tempest roars, its aspect is terrific; and we must be hardy indeed, not to consider it as a most formidable element in such times of awful visitation, when ships, breaking from their anchor, or driven from their course, rush before the winds that beat upon them with ungovernable fury, till, dismasted, and their rigging shivered in fragments, they sink, overwhelmed with a weight of waters, or strike some sand-bank, of shelving rock, and are at once dashed to pieces. Sometimes whirlpools, or vast masses of water with a violently circu.ar motion, whirl the unfortunate vessel that fate urges into their vortex, with irresistible force, till the helpless victim sinks an easy prey to the tremendous gulf, and the cries of the unfortunate wretches are lost in the roar of the waves: these whirlpools are occasioned by rocks in the ocean, and the meeting of numerous currents and eddies. 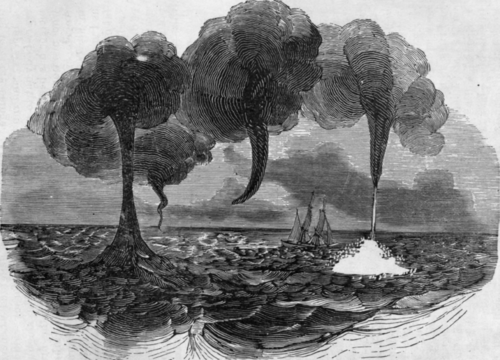 Not less dangerous are the waterspouts, that the wind raises from the sea to the clouds; they hover in the air high above the ocear., and the wind whirls them round with violence. They often burst with a great crash, and occasion much mischief; for if they fall upon a vessel, they destroy its rigging, and some-times sink it to the bottom. "But it would be highly unjust and ungrateful, only to consider the losses occasioned by the sea, without reflecting upon the magnificent and stupendous works of God, and that goodness which even visits the unfathomable depths of the ocean. The first thing that strikes us, upon the investigation of sea water, is its saltness; a pound of the water containing about two ounces of salt. Sea salt appears lighter than that we commonly use, and yet it is not attracted by the air, nor lessened by the continual influx of fresh water; the cause of this is unknown. If this peculiar quality arose from mountains of salt contained in the sea, it would be Salter in some places than in others, of which we have no proof. But what-ever is the occasion of this saline property of the sea, it is absolutely necessary to accomplish certain ends. It is that which preserves such a vast body of water from corruption, and renders it capable of supporting a greater weight. The colour of sea water is also deserving of attention: it is not every where alike, which perhaps arises in part from its reflecting the colour of the bottom and that of the sky. It often appears dark and black in deep abysses, white and foaming during a storm, silvery, and gilded with reflections of the most beautiful hue, when the last rays of the setting sun play upon the unruffled surface: the colour of the sea, in addition to these, varies, from numberless insects, marine plants, and the combination of the different substances which the rivers and torrents carry with them into the ocean. When it is calm, and not a breeze skims over its bosom, it sometimes glitters with the most brilliant stars; and the track of a ship cleaving the waves has often a luminous appearance, like a river of fire. "The creatures which inhabit the sea excite our surprise and admiration; we there discover a new world, and the number of beings which compose it is prodigious. Aquatic animals are not so numerous in their species as the land animals; but they surpass them in size and duration. The elephant and ostrich yield in bulk to the whale, the largest fish of the ocean, its length being often from sixty to seventy feet; and no land animal can vie with it in longevity, for it lives as long as the oak. If we may rely upon certain accounts, there are creatures in the ocean, far exceeding the size of the whale; as the animal called kraken, said to exist in the northern seas, and whose circi inference is half a German league. Who is able to number the different species of animals which people the seas? or who can determine their form, structure, size, and propertiis? How infinitely great is that God who has created the sea! will be the conclusion of all who investigate the subject, and it is not without the wisest reasons that the Creator has made the ocean and the seas to occupy two-thirds of the whole globe. The seas were designed not only to form great reservoirs of water, but by means of their evaporation to be the sources of rain, snow, and various meteors. What wisdom is displayed in the connection which the seas have with each other, and in their continual motion! And it is not less wonderful that the bottom of the ocean is of the same nature as the surface of the earth. There are found in the sea, rocks, caverns, plains, springs, plants, and animals; and the islands are only the summits of a long chain of mountains. When we consider that the seas form a part of the globe the least investigated, we are disposed to believe that they contain many more wonders, which neither the senses nor the understanding of man can penetrate, while all acknowledge the adorable wisdom and power of the Most High. To Him then, who has established the monuments of his grandeur and the sceptre of his glory in the ocean, as upon the earth, be ascribed all admiration and praise!"